A combination of weak global sentiment, weak Australian data and a dovish RBA speech had Aussie pairs seeing red almost all week! Global risk sentiment was likely a contributing factor to the Aussie’s relative performance this week, and for a broad rundown of what drove global risk sentiment, check out my review of this week’s risk sentiment drivers and broad market behavior in my Japanese yen weekly review here. In short, we saw early risk-on sentiment to start the week (likely a carry over from Friday’s bullish sentiment on positive U.S. data), but traders turned bearish on risk assets from Wednesday on as the picture of global growth turned gloomier, mainly on a heavy week of negative economic reports from around the globe. Despite a bounce in global risk sentiment to close the week, traders were still in risk-off mode, and likely the reason why we saw the Aussie’s performance against the safe havens far under perform versus its under performance against the high-yielders (NZD and CAD) to close the week. This week was also unusually heavy with Australian economic events, and there were a few events in particular that sparked uniform movement among Aussie pairs. First, we saw uniform weakness in Aussie pairs on Tuesday after the disappointing retail sales data from Australia (-0.4% vs. 0.5% previous). It was a short-lived drop, though, as the Reserve Bank of Australia gave their rate policy statement (holding the cash rate at 1.50%), which turned Aussie sentiment around quickly as it appeared the RBA was keeping an upbeat outlook on the economy. This was viewed as leaving the possibility of a rate hike as the likelier next move scenario. 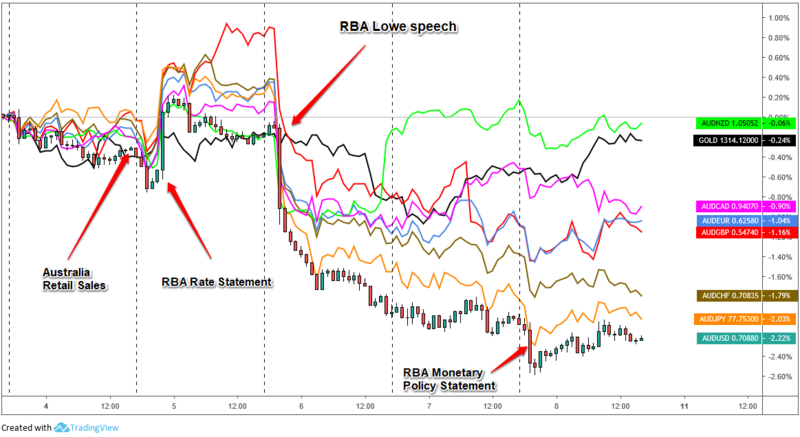 But it all turned for the worse for Aussie bulls come Wednesday after RBA governor Philip Lowe said that rate cuts were a possibility during a speech to the National Press Club in Sydney, doing a 180 on the idea that only a rate hike was next move. The Aussie fell strongly across the board into the Thursday trading session and never recovered, likely due to the broad risk-off sentiment that kept high-yielders and risk assets in the red. And the bears likely got help from the latest RBA monetary policy statement on Friday that showed the RBA’s concerns on the housing market which likely helped keep the Aussie in last position as the biggest loser of the week!